What had seemed like a fairly normal day of baseball turned into something more thanks to one game in particular that decided to not play by the rules. Read all about it and much more in this edition of the Twins minor league report. -OF Mark Contreras promoted from A+ Fort Myers to AA Pensacola. Jaylin Davis was placed on the Injured List. Truly, one only needs to take a glimpse at the box score to capture the essence of one of the more absurd baseball games to ever be played, not just including the minor leagues, but of all time. In total, the damage was a ridiculous 15 home runs combined between the two teams and 38 runs scored in 10 innings. The major league record for home runs in a game is 12 if you wanted a frame of reference. In a game where a “safe lead” would be considered outright laughable by those playing, over a full mile of home run distance was blasted out of Frontier Field. Those in a 10-mile radius of the stadium who enjoy the art of pitching keeled over left and right as homer after homer was launched in an attempt to confuse those whose job it is to observe the results and force those poor individuals to declare the box score to be broken. No pitcher who was forced into this onslaught left without scars as each pitcher gave up at least one unearned run and only the lucky Edubray Ramos was left without an earned run to his name. The “winner” of this game, Josh Martin, was touched for three runs over his two innings of work along with a blown save, a shining example of why pitching wins is a flawed stat. Red Wings starter Chase De Jong was tossed in the fourth inning along with manager Joel Skinner in what was probably an act of grace towards both individuals by the home plate umpire. Home runs by Zander Wiel and Ronald Torreyes in the bottom of the eighth inning gave the Red Wings a slim one-run lead heading into the ninth that was eliminated by a game-tying shot from Jan Hernandez. A 10th inning three-run home run by Sean Rodriguez would be the final blow needed to end the game as the Red Wings could only respond with a Willin Rosario RBI single in the bottom half of the inning. The Blue Wahoos offense could not do much as they scattered three hits across the nine frames along with three walks that amounted to zero runs. An eighth inning RBI single by the Jumbo Shrimp proved to be the only run in the ballgame as both squads decided to be the exact opposite of the Red Wings game earlier. The Fort Myers Miracle secured an away series win against the Clearwater Threshers with a clean 3-0 shutout, their third shutout of the week. RHP Bailey Ober continued to dominate hitters as he threw six efficient shutout innings to go on top of the six shutout innings he threw in his last start, giving him a predictable ERA of 0.00 on the season. After a great 2018 season at A+ for Ober and now these two strong performances, maybe it is time to consider whether he should be in the top 20 prospects list. The game was a 0-0 stalemate until the top of the sixth inning when Aaron Whitefield hit a double and Royce Lewis thought that he too would like to be on second base, so he hit a double of his own, scoring Whitefield on the play. That run would have been all the Miracle needed to win, but such a future would be too boring for Ryan Jeffers, so when he stepped up to the plate in the seventh inning with Lewin Diaz at first base, he determined that a two-run home run now would be the best time for his first homer of the year, and so he made it be as he blasted a homer, giving the Miracle a 3-0 lead that would hold until the end of the game. The Kernels and Bees felt the cosmic shift that was the Red Wings and IronPigs game and decided to off-set it with a nice, close, low-scoring game that would cleanse the pallet of pitching lovers everywhere. Even the runs that were scored were done so in an unusual way with a second inning Kernels run coming from a wild pitch that scored Michael Davis and a seventh inning throwing error that scored Trey Cabbage. While the Bees might be upset at how these runs went down, at the end of the day, a run is a run and a win is a win. The Kernels pitching trio of Josh Winder, Brian Rapp, and Joe Record combined to strike out 15 total Bees while allowing only four hits, one of the extra-base variety. Please feel free to ask any questions and discuss Saturday’s games. Massive shout out to the Red Wings and IronPigs for having the game of the year on the day that I got to do the report, so glad that they were thinking of me. Wow, what an insane game! It's not good that Romero gave up 4 of those runs, though. What a bloodbath of offense! DeJong probably needs to go on the IL suffering from shell shock. I watched the first three innings of the Red Wings game. Randy Cesar had his seventh error in seven games. There were a couple of balls called hits that could have been called errors. Wilin Rosario had two early passed balls. Crazy bad defense. The other thing that is interesting... AAA is now using the MLB baseballs... I wonder how many homers will be hit in AAA this year. Bailey Ober now has 12 shutout innings. Griffin Jax has 10 2/3 scoreless. I think that Devin Smeltzer is at 14 scoreless. Bryan Sammons is at 10 scoreless. Lewin Diaz is hitting .480. Red Wings are getting close to becoming laughably bad. They need to turn it around and start playing the .400 level ball we expected. The National Weather Service reported 20-30 mph steady wind with gusts to 45 mph during the Red Wings game. That will easily drop a routine fly ball in the seats. Dr. Alan Nathan, a physicist and baseball consultant, has a publicly available baseball trajectory spreadsheet. The calculations are based on test data and statcast info. Rochester's stadium sits almost west to east for a hitter. The wind was out of the west. The actual wind was at a slight angle to ballpark orientation, so this is a best-case estimate for hitters. Still... a routine fly ball becomes an easy HR to the RF/CF gap. Yeah I watched the video above. It looks like dudes were hitting shallow pop-ups that were ending up as HRs. Looks like it was just one of those weird weather days. I dislike having 4 of our top 15 prospects on the injured list. hope they all heal quickly and well. Nice start for Griffin Jax. He's a guy I like quite a bit, and I think he's going to be pushing his way into the top 20 list this year. You have to think that having his status resolved and being able to really focus on baseball is going to help him develop. Correct me if I am wrong, but it wasn't that long ago when hitters dominated our top prospects with few pitchers thought of having a chance to be front half of the rotation starters.But that sure doesn't appear to be the case early this season.The list of starters giving up few, if any, runs is lengthly...Graterol, Alcala, Smeltzer, Jax, Ober, Sammons, Duran, and Balazovic.If my math is correct, that's 8 starters and doesn't include several others who have early ERA's in the vicinity of 3.00. Will any of the above make it to the Twins and become that shut down ACE every team needs?Don't know, but I would much rather have 8 guys pitching like this than one or two as in the past.Because if any of these can keep this up they will have a chance to join Berrios at the front of a future starting rotation. The Blue Wahoo headline says they won 5-0. Box score says 1-0. Totally agree with rdehring about the pitching. Twins have good young hitters already (with a couple more in the minors). But I don't ever remember this number of pitching prospects working their way up the ladder. I hope the Twins are aggressive with their advancement. Rochester has the makings of a team that is going to be able to lose in all kinds of different ways. One of the more relevant thing that happened last night is that Ryan Jeffers finally had a game where he contributed offensively. Meanwhile, he threw out 2 or 2 would-be base stealers. He's now thrown out 3 of 6 on the young season. Rortvedt has thrown out all 4 who have attempted steals against him. I find it interesting that, so far (10 games), neither Rortvedt nor Jeffers has appeared in a game at a defensive position other than catcher. It's either catcher, DH, or bench for both. The time behind the plate seems to be split evenly. That was the first thing I thought about when I saw the insane number of home runs in that game: are they using a juiced ball in that league? When most of the hitters are struggling and most of the pitchers are dominating it's probably a good idea to look at the overall run scoring environments of the leagues that they are playing in.So far, for whatever reason, offense is down in both the Southern League and the Florida State league from last year.It's pretty close to the same in the Midwest league and way up in the International League (further evidence that, yes, the MLB ball was juiced a couple years ago, and at the very least it is a lot better for offense than the minor league ball). SSS, of course. But not THAT small...Helman's is the smallest...he's 1 for 20 on balls in play. Team OPS is .588 and they're 6-4... because the Pitching has been ridiculously good. Still, it will be more fun to watch this club when balls start finding the grass, as it's always a struggle to hit the ball over the fence in that park and that league. And the exact opposite was true in Pensacola, where the broadcaster (Joe Garagiola's grandson!) couldn't remember a game with such a strong wind off the bay, against the batters. Popups to shortstop were ending up 5 rows back in the seats behind the dugout. Seems like Twins' minor league pitching has been exceptionally good and the hitting pretty bad. Kind of surprising.Does anyone know when Kirilloff is expected back from the injured list? Can't say I love them splitting time. They both need to be catching, not sharing the role. Maybe one of them will get an early promotion (Rortvedt would be my choice) so they can both get the time behind the plate they need. For a number of years it has seemed to be the policy of the Twins to limit their minor league catchers time behind the plate. They may play other positions or appear at DH, but you don't seem To see any of them catching more than the half the games. I assume that there are reasons for this. My guess is that catchers can get pretty beat up in the minors, because so many pitchers have control issues. I don't know the actual reasons. Maybe Seth or one of the TD experts knows more about this. The Blue Wahoo headline says they won 5-0. Box score says 1-0. Thank you for pointing this out! Not sure how I messed that up. Any thoughts on what's actually wrong with Romero? Velocity? Control? Pitch mix? Red Wings game reminded me of one I attended quite a few years ago at Coors Field. 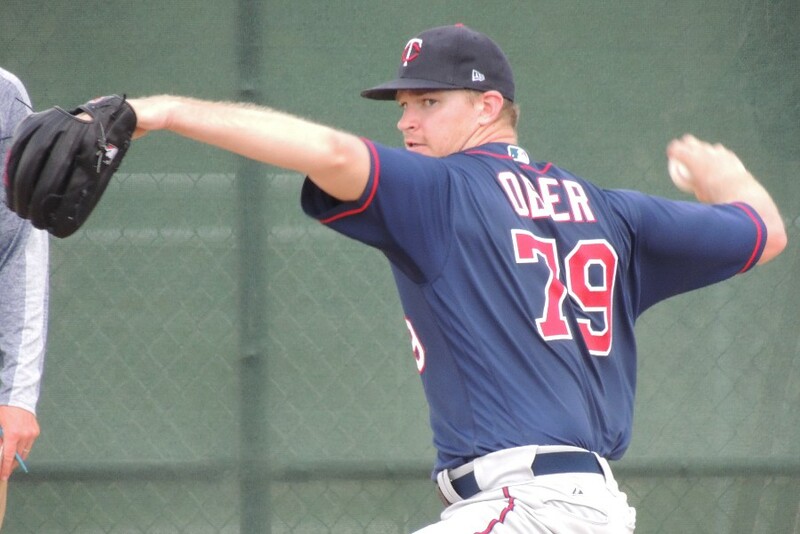 → Article: Twins Minor League Report (4/13): We Are Talking About the Same Sport, Correct?